An overarching Vision for the Neighbourhood Plan was developed though research and consultation with local residents. The Vision led to a set of Objectives from which a set of Planning Policies have, in turn, emerged to form the core of our draft Neighbourhood Plan. Our vision is for Boughton Aluph and Eastwell Parishes to retain its distinctive rural character at the urban edge of Ashford, surrounding the village of Boughton Lees and within the hamlets of Boughton Aluph, Eastwell and Kempe’s Corner by carefully integrating the Eureka Park expansion of Ashford into the local landscape and successfully interweaving high quality new development into the Goat Lees area of Ashford and the historic fabric of Boughton Lees. The Parishes will continue to be served by enhanced key local services and public open space. 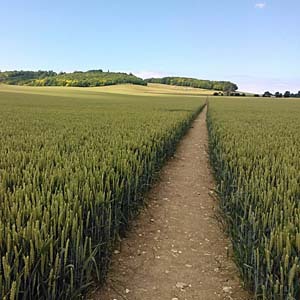 To protect the character of the landscape and conserve and enhance the natural beauty of the Area of Outstanding Natural Beauty which provides the setting for houses at Goat Lees, the village of Boughton Lees and hamlets of Boughton Aluph, Eastwell and Kempe’s Corner. To conserve and enhance the heritage of our Parishes, including the Boughton Lees Conservation Area. To protect Local Green Spaces within the built up areas of the Parishes. To protect distinctive, locally valued views. To ensure high quality design in all forms of development which responds to the distinctive landscape, heritage and character of the Parishes. To assimilate development of a scale which protects the character of the landscape; conserves and enhances the natural beauty of the Kent Downs Area of Outstanding Natural Beauty and its setting and preserves and enhances the character and appearance of the Boughton Lees Conservation Area and its setting. To ensure that future development at Eureka Park maintains the parkland setting and successfully integrates business and residential development within the landscape. To ensure sufficient infrastructure and local services are provided to serve the needs of Parish residents, including new provision in association with new development. To promote well-being and healthy living. To protect and enhance recreation open space and community halls. To protect and, where possible, to grow the network of footpaths and cycle paths serving the Parishes. The original draft Vision and Objectives were based on feedback from our community consultation in September 2015. The wording was refined in light of the response to the Neighbourhood Plan Survey held in 2016 and will be kept under review up to and including the official 6 week Pre-submission Consultation on the draft Neighbourhood Plan. Let us know your views on the Vision and Objectives in the Draft Plan by filling in our questionnaire. The objectives seem good to me. Think you have it all covered. Thank you for your feedback Jane. We’re pleased to know that you think we’re on the right lines! Thank you for your most informed and helpful Newsletter No 6, which was most professionally produced. So much time and effort has clearly gone in to producing this information and the structure upon which it is based. Most impressive, thank you. Thank you for your feedback Derek. We’re pleased to know that you think we’re doing a good job. Going forward, there will be new developments happening nearly every month so please keep an eye on our progress.